Dieting is a heavy issue, not to be taken lightly.. (Pun intended). Most of us diet religiously - we eat what we want and pray that we won't gain weight. 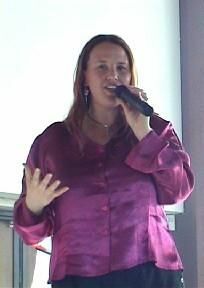 In my lecture I tell my own story - In my life i've gained and lost weight, I've been a member of weight watchers going on five years and worked there for the past three years. I even wrote my thesis on Diet humor. I give funny examples, diet humor and actual weight loss tips based on my research, my experience, and my training as a public health instructor. So if you want to learn how to eat your cake and leave the calories on the plate this is the lecture for you. Humor inspires students to learn. It reduces teacher burnout and stress. Humor generates camaraderie in the classroom. Students develop a group identity by laughing together. Students who laugh during class quickly become committed to paying attention. Once they are relaxed and invested in the learning process you can take them anywhere you want to go. In my lecture I talk about the advantages and pitfalls of humor in teaching... and yes - my lecture is also fun and funny. Learn how to incorporate humor into your organization, and start laughing today! So come and get in touch with your lighter side - yes, everyone has one.. even you!